Welcome to the Norgate Civic Assocation (NCA)! Norgate Residents - Get on the NCA eList. Pay your 2015-16 dues! Fill out the membership form and send it to our treasurer together with a check for your annual NCA dues. Your email address will be added to the NCA eList to receive important news of Norgate and the Manhasset community. - Our neighborhood Spring Clean-Up, scheduled for Saturday, April 25th, from 10 AM to 2 PM. - Traffic & safety concerns. - Scheduled work on Memorial Field. Norgate Community Cleanup – May 3, 2014. 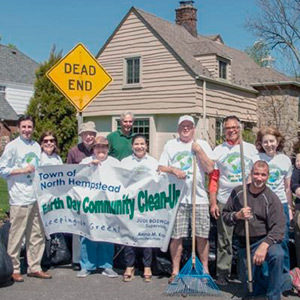 Thirteen Norgate residents turned out to rake, clip, weed, mow, and meet with Town Councilwoman Anna M. Kaplan and Town Clerk Wayne H. Wink, Jr., who sponsored the event and provided t-shirts for participants and trash bags for the debris. The job of cleaning the entry to the community along Norgate Road took about an hour and a half. After a cold snowy winter and a rainy spring it was a pleasure to get outdoors on a sunny day, meet with neighbors and Town leaders, and really accomplish a needed task. Not pictured with the group is Erdal Can, who scraped, caulk cracks, and touched up the paint on the Norgate entrance pillars. -Our neighborhood Spring Clean-Up, scheduled for Saturday, May 3rd, from 10:30 AM to 12 Noon. Come out to spruce up Norgate! - Dues collections by the Norgate Civic Association’s Treasurer. - Repair of Norgate street lights. - Reports on the Town’s S.T.O.P. program and evening hours of the Applicant Advocate of the Town’s Building Department. - Efforts to reactivate the Association’s three standing committees, traffic & safety, beautification, and social events. - Collection of resident information necessary for the publication of the Norgate Directory.